In this example we want to customize the Time Entry Grid page to hide the Save and Submit Time Sheet button. We would prefer that the users submit their time on the Time Entry Worksheet so we simply take the submission option away when using the grid entry. Use Inspect from the browser right-click options to find the ID of the button you need to hide. The right click option will first present the PI options so we need to use the Hide option from the first right-click to get back to the right-click options for our browser. Copy the id, which in this example is "saveAndSubmitTimeSheet." Use the Culture & Interface Labels to customize the form for our system culture. If you do not already have a custom culture you will need to make one. See the Culture and Interface Labels topic for more information. Set Your Current Personal Setting to the culture you would like to change, making sure you have checked the box to "Enable Editing Directly On Forms." Navigate to the Time Entry Grid. Click the hyperlink to Show Additional Editable Text. Insert and save the following code which includes the earlier-referenced button ID. 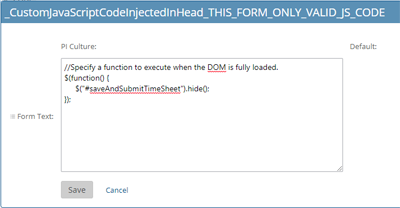 //Specify a function to execute when the DOM is fully loaded. Return to your Culture and Interface Labels to refresh the changes and remove Your Current Personal Setting along with the previously selected checkbox. Save the change and wait several minutes for the changes to propagate before testing the results.